This is an important question in every writer’s life. 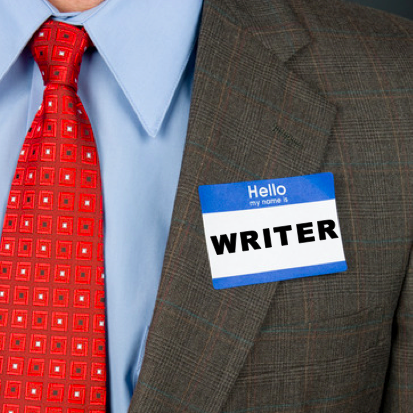 At what moment in time can you actually refer to yourself as a writer? When can you look in the mirror and call yourself a writer? And when can you call yourself a writer in front of several complete strangers at a party? When can you call yourself a writer in private? Tell yourself in the mirror before you brush your teeth, then again when you’re driving home from work. Say it so many times that you get exasperated looks from your spouse. Heck, get business cards printed, too. I remember reading somewhere that Robert De Niro will sometimes repeat his lines dozens of times before filming a scene, in an effort to make himself fully believe what he’s saying. That’s your goal: say it, then say it again until you believe it. When you finally call yourself a writer, it drives home the fact that this is real. It’s serious. We’re no longer talking about some vague ambition. You’re a professional writer who has to produce content, be that novels or nonfiction books or articles or whatever. Go ahead and say it right now: “I am a writer.” The more it becomes real for you, the more it will drive you to sit down as much as possible and put words on the page. The answer to this question is also now — but this is a different matter altogether. The reason you want to take this step immediately in public is to apply pressure to yourself. If you start telling people that you’re in the middle of a novel, then you darn well better be in the middle of a novel. But here’s the rub: there are two things that happen when you’re in public and first start referring to yourself as a writer. The first thing is your friends and spouse may have an irksome tendency to snicker or roll their eyes. The truth is that one cannot become a doctor or welder simply because they say they are. Such professions take degrees and certifications. But writers don’t need degrees or training, so it may seem like a “cheat” or “exaggeration” to others that you’re suddenly calling yourself something as prestigious as “writer.” So you don’t want to call yourself a writer in public until you’re fully ready to shrug off any silly passive-aggressive nonsense from college buddies. Obviously, at the beginning of your career, with no real credits to speak of, you won’t have much to say when people start asking for details. This can cause embarrassing moments of silence, or rambling explanations that reek of self-doubt. So don’t refer to yourself as a writer in public until you have a plan to deal with follow-up questions. So if you don’t feel like you can confidently answer the question, or are embarrassed to say aloud that you haven’t been published, think twice before mentioning your writerly aspirations at a soiree. But don’t forget that the sooner you start calling yourself a writer in private and in public, and the sooner you create a website and business cards, the sooner you will realize your career choice is a serious endeavor and demands your time and attention. And that is what will drive you to sit down, put in the hard work and create. The giveaway for Chuck’s book Create Your Writer Platform is now over. Thanks for all your comments. Congrats to Teresa Bruce! In this eguide, Alexis Grant explains how she turned her side business into a full income, with an emphasis on making money from ebooks. I took the steps to create a social presence as a writers to build accountability. Between sharing a Facebook page, WordPress blog and Twitter account with friends and family, now that those around me have started asking me how my writing is going and I feel obligated to have a honest answer. It’s good to read your comments Mike about building a social presence as a writer via twitter or facebook. I was debating whether to call myself a writer on twitter, still am, sent four queries regarding my first YA novel which were rejected but not without some encouraging comments. Am currently working on my second novel which is a ghost story and one which I feel more confident about. Although I currently have a ‘day job,’ after reading your post it makes me feel a sense of verification in calling myself a writer. Great article, Chuck! Taking ownership of saying you’re a writer has a profound effect. It really helped me and it’s something I tell the writers in my writing group. If you don’t believe you’re a writer, no one else will either. Well,put. I’ve been writing for years. Seriously more now. I’ve always enjoyed writing and creating. I live in my pages and breathe the ink. I need to express myself and it renews my spirit. Keep up the good work and thank you for the encouragement. We think what we become. Great advice. I sometimes run and breathe to “I am a writer” so it sinks in. The tips for what to say when your clips are minimal or non existent are helpful. The first few times I was asked it felt awkward but each time I responded my confidence grew. I’ve been calling myself a writer since my first article was published in a newspaper. Granted that was in a school newspaper back in high school – but the great part about the story – it wasn’t changed from what I submitted. Since then I’ve worked on other papers, submitted to magazines, and have been participating in a writing challenge every November. I do call myself a writer. I work with people helping them develop their writing, and the NUMBER ONE obstacle is they don’t believe they’re writers. It’s so much easier to give up when even you don’t believe in what you’re doing. The only thing you have to do to call yourself a writer is write. Simple. I couldn’t agree more, Leigh. I started thinking of myself as a writer and calling myself one when I began taking my writing seriously and writing every day. I think it’s a combination of self-belief and action – it’s no good believing you’re a writer if you’re not actually walking the walk. As you say – you have to write. If you’re doing that, whether you’ve got a book published or not, I reckon you’ve every right to say you’re a writer. You are touching on one of the most important issues when saying I am a writer – confidence. It is the same thing needed to promote yourself, your work, and establish social media. I am a writer, even had a story published in an anthology. As I work on my memoir (second draft), I am beginning to shake in my boots thinking about the future of sending out a query and approaching agents. Granted I have to finish this revision and another one or two before that happens, but I lack confidence in selling myself. Chuck makes an excellent point about responding with confidence when others approach you about your work. If you laugh off your own attempts at being a writer, who else is going to take you seriously? Never apologize for being a writer. There is sometimes this stigma attached that you have to be have a book with your name on the shelf or have credits in these national publications in order to merit the title ‘writer’. You don’t. If you write articles, you’re an article writer. If you write book reviews, you’re a book reviewer/writer. If you write poems… you get the idea. You can’t control who everything about the publication process but one thing you can control is how you view yourself as an artist, as a creator, and making the time to do the work of writing itself, to constantly improve your craft. As Steven Pressfield says, “Do the work”. Well, I better say I’m a writer! I dedicate several hours each day to this endeavor either by doing research, editing, re-writing, or honing my craft with workshops, and writing groups. When I eventually read out loud to other than my mirror I know I’m a writer. Handing out business cards gives me a high. Calling oneself a writer is a difficult decision. There’s an even more difficult question to consider. When does a writer become an author? one helpful thing I read is that most writers write because they MUST…it is an inborn sense of needing to express themselves, record what they see and feel, and to create with words. It is like an artist who picks up a pen to make a sketch…when is he/she an artist…?? Right then. With their first creation. As are we…writers, that is. Becoming a published writer is a thrill but it does not make you more of a writer. It just acknowledges you in a commercial way and is the frosting on the cake. One telling thing is that a person hearing that writers don’t make what they used to and that it is “iffy” to be able to make a living as a writer can have two responses one being to stop writing because it is not worth it and the other is to write anyway. The latter is a writer! Darlene, do you mind if I share your post with my classes? Certainly, I will credit you with the message…but you articulated so clearly the difference between being a published writer and not yet being published. Thank you so much for such a thoughtful, intelligent post! I hope your class enjoys the article, JudiLeigh! Great post. I’ve written as a journalist and then in communications/marketing roles for nonprofits for 20-plus years — so I’ve always called myself a writer/editor. Yet, just started writing fiction four years ago. For me, it’s not a question of calling myself a writer, but calling myself an author (as Joel Heffner pointed out). Does the act of writing novels make one an author? Or does formal publication? I think the former. Great advice! Keeps us accountable. I am a writer when I have the time to pen my thoughts uninterrupted. Great post! I’m still in high school, and a good way from being ready to publish anything, but I absolutely consider myself to be a writer. Then, as Mandy and Joel said, there’s the question of what makes an author. I don’t consider myself to be a novelist yet, because I’m still working on my first novel, but I’m committed to writing and to improving my work, and I love it, so that makes me a writer. Your point about confidence is really good. It’s strange how people seem to think that being a “writer” means having written a book they can find in a bookstore or on Amazon, or having at least written a bunch of articles that everyone’s read, but it’s really so much deeper than that. 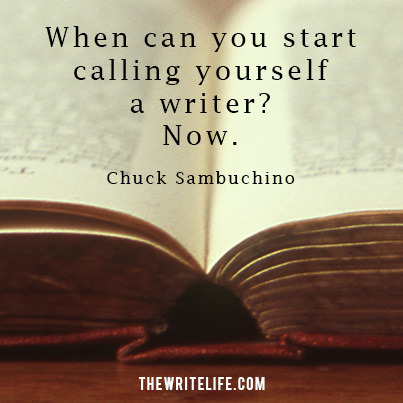 When can you call yourself a writer? When it hurts not to. That’s a pretty neat trick – applying pressure to yourself, but I have found that this works better if you do the exact opposite. I call myself a “word enthuziast” and I get more done with less pressure. The answer is…. When you have written. Right on, Chuck! Thanks for helping us to carry on! Thank you Chuck. I can’t help but be a writer. Having said that, when I settle into the seat of my soul, I don’t write. I take dictation from the Divine universal spirit. I’m often blown away by what comes to me in my moments of inspiration. I once told my mother I was a writer, and, at the time, I wondered at her lack of response. Two days later, I received a package containing a beautifully designed and embellished tinfoil hat. It was a thing of beauty. I’ve been writing for many years as a marketing communications pro, but I never used that term until I began expanding into creative writing. Then, all of a sudden, it felt like I was an impostor when I did say it. I finally became comfortable with it when I progressed far enough in my creative writing to be able to evaluate my drafts in a way that truly moved them forward. I am a writer and poet because I think about writing all the time and I have published web content and poems in magazines. It is who I am and what I do, and without it I am denying who I am. When I tell people I am a writer, I still receive skeptical looks or dumb silence, but I don’t care. Writing makes me whole and where I excel, even though, financially, I haven’t gained much. I believe that part will be filled in sooner than later. This was just what I was needing to hear. I have finally decided to start being more open about the fact that I am working on some writing projects with the goal of publishing eventually. Recently, my husband and I have been talking about this– and quite frankly, my confidence isn’t there, but an opportunity came when talking to some friends, and I decided to divulge the secret… “I am a writer.” There were some questions with me fumbling about how best to answer. But, for the first time, it is out there to someone I personally know, and it felt good. Though I wish I could have read this article beforehand….